GoodReads Summary: At the end of World War II, Jack Baker, a landlocked Kansas boy, is suddenly uprooted after his mother’s death and placed in a boy’s boarding school in Maine. There, Jack encounters Early Auden, the strangest of boys, who reads the number pi as a story and collects clippings about the sightings of a great black bear in the nearby mountains. 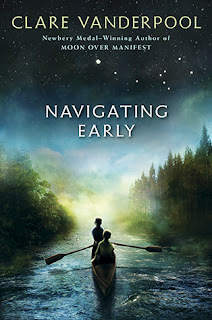 What I Think: I'm trying to gather all my thoughts about Navigating Early so I can write a review that does it justice. My thoughts are going in all different directions for a few reasons. First of all, I looked at this book as an upper middle grade book, something a 6th or 7th grader might read, but now I can see how it might actually be better suited for older students. This story started out really slow for me. It was hard for me to get into all the characters and to see where the story was headed (this is mainly why I had to give it four stars). I wonder if I would have had a different perspective if I had more information going in. The summary on the back of the book and from GoodReads leave Early's story very vague but I think it would have helped me to know a little more about Early's story so that I could have either started to piece things together earlier in the story or so I could have had a sense of knowing that Early's story was going to connect before it actually did. In the end, I'm so glad that I kept reading this story because it really did all come together and it is a beautiful story of dealing with loss and of how all of us have different stories to tell but how our stories do intertwine or overlap or depend on each other. In conjunction with this whole idea of trying to figure out who I would recommend this book to, I'm grappling with this text as historical fiction. It definitely is historical fiction because it is set at the end of World War II but there were times when I found myself having to remind myself of this. At one point, they boys meet a woman born in the 1800's in the book and my mind was racing to figure out if this woman was a ghost or magical or something...but then I remembered that the story wasn't set in current times so it would be plausible for them to meet a someone born in the 1800's. I thought I was going crazy for a second. All of this really has me thinking that this book would be great as an option for high school students to read when learning about World War II. Looking at how civilians perceive soldiers and then at soldiers and their stories and the trauma they face and deal with is so fascinating to me. There seems to be so many soldiers who grapple with what they do or don't do in times of war. My heart breaks for soldiers who give so much and who we are so thankful but who have a hard time accepting horrible things they had to do or sometimes did innocently and now have to deal with emotionally. This book had me thinking about other stories I have heard personally or read about and the rich discussion that would come from discussing this with high school students. If I had read this book with the lens of looking at it as historical fiction that tells the stories of civilians at home during World War II and of a soldier in World War II, I think I also would have been more conscious of what the story was really telling me about this time period in general. Writing all of this has already helped me focus my thoughts. This book really is about a boy who has lost his mother and how he deals with this and the other people he meets along the way who are telling their own stories while influencing his. It ends up being a wonderful story of humans and how we love and support and care and survive and live for each other and ourselves. Overall, I think it's a story readers need to be introduced to but so important that it might better be given to mature or older students who can appreciate the depth of this book. Writing Prompts: Write about a time in your life when you helped someone or someone helped you. Write about a time in your life when you were loyal to a friend or a friend was loyal to you.